In 1999, when I just had started my Ph.D project in Gouda, I had a fantastic idea. An idea so fantastic that in the next 10 years I would dedicate a huge amount of time to sustaining and developing it. Too much time perhaps because sometimes it destroyed my time to sleep. The idea was that I would launch a website about and for my research and that also dealt with all kinds of issues related to it. He sees his current blog Closer as one of his contributions to a public anthropology. He discusses several examples of good public anthropology. Public anthropology is not only about reaching a broader public. It is not just about giving answers to questions the public has. Public anthropology means also questioning why particular issues are addressed in the way they are (f.ex debate about islam) and what the consequences of that are. What are the historical and cultural contexts? What is taken-for-granted and what does it mean? Many people in my current research project have read my PhD thesis, there have been discussions about it in chatrooms in which I present for my current research and several people emailed me, contacted me in the chatrooms and on MSN wanting to discuss my book and the publicity about it. Opening up your research in fact already begins at the initial stage when you have to explain to your informants what you are doing and why you are there where they are. In my experience, the conversations that follow from this are not only a good a way of improving your ‘translation’ skills but also provide relevant input for your research. The same can be said about the questions people asked after reading my book and articles. As good public science indeed can produce better social science because the public is allowed to question and test the hypothesis of the researcher and even the significance of the whole research. The current development in social sciences that only writing in Anglo-Saxon journals is valued above anything else (or better, the rest doesn’t matter) could lead I’m afraid to a situation in which social sciences are not relevant anymore for native, non-English publics and render the cause for a public anthropology futile or even ridiculous. Together with his colleague Henk Driessen he is going to organize an international workshop on anthropology and publicity in 2010. 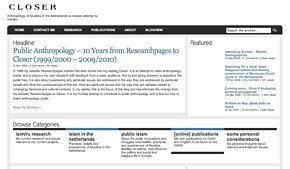 His anniversary might be an opportunity to remind of recent posts about Public Anthropology at Neuroanthropology.net, for example Top Ten Ways for Anthropologists to Make A Difference and Expanding the Top Ten Ways for Anthropologists to Make a Difference or Varieties of Public Anthropology. Furthermore. Maximilian Forte has started a series of posts about “Zero Anthropology“, about “knowledge after anthropology” - posts that will bring his blog unfortunately to a close.